Sony - TAIT2-80N SONY - 80/208GB 8mm AIT-2 TURBO NTV DATA CARTRIDGE (TAIT2-80N). NEW. IN STOCK. MINIMUM ORDER 6 PCS. SHIP SAME DAY. 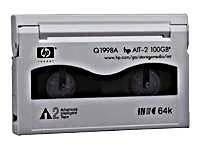 Hewlett Packard - Q1998A HP-COMPAQ : AIT2 50GB/100GB 230 METER TAPE MEDIA (Q1998A). NEW. MINIMUM ORDER 10 PCS. IN STOCK. SHIP SAME DAY. Sony - TAIT2-80C SONY - 80/160GB 8MM 186 METER AIT-2TURBO DATA CARTRIDGE W/MIC (TAIT2-80C). NEW. IN STOCK. MINIMUM ORDER 10 PCS.SHIP SAME DAY. Sony - SDX250C SONY - 8MM 230 METER AIT-2 50/100GB TAPE CARTRIDGE (SDX2-50C). NEW. IN STOCK.MINIMUM ORDER 10 PCS. SAME DAY SHIPPING. Sony - SDX250CAWW SONY - 50/130GB AIT2 8MM 754.59 FT TAPE CARTRIDGE(SDX250CAWW) W/MIC. NEW. MINIMUM ORDER 3 PCS. IN STOCK. SHIP SAME DAY. 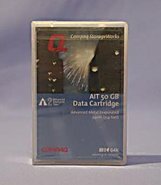 Compaq - 5pack ORIGINAL Compaq 8MM AIT2 Tape Cartridge 5-pack PN: 152841-001 50GB Uncompressed / 100GB Compressed AIT-2 230M tape cartridge. SAME AS Q1998A. Sony - 10SDX250CBA SONY - 10pk 8MM 230 METER 50/130GB AIT2 TAPE CARTRIDGE (10SDX250CBA). NEW. IN STOCK. SHIP SAME DAY.